Joshua David Gould of St. Louis is the latest Orthodox Jew to be involved in a Ponzi scheme - based on the unreliable say-so of the antisemitic media, and the Jew-hating federal investigators. This is an outrage, a travesty and, once again, also a golden opportunity for me to cash in. I invite you to please join me in the great mitzvah of defending the indefensible, as described here. Please swap in the name of last years travesty, with this year's walking embarrassment. ...I chose to do this after realising just how much more good my money could do for others than for me. I'm a research fellow in ethics, and my thoughts on the ethical issues around global poverty have had a dramatic impact on my personal behavior. Philosopher Peter Singer—a fellow Australian—said that the money we spend on luxuries could be used to save people's lives in developing countries if we so wished. How then can we justify choosing the luxuries? This is a strong argument, and quite confronting. This is also quite a clever way to outmaneuver the local richies. Can't afford an extension on your house, or a landscape created by the local hot gardener? Try this instead: Give away all your extra money, and forgo all luxuries. You'll gain peace of mind, countless mitzvah points, and the moral high road! Last night, while flipping through the channels, I was astounded to see Peter Popoff, the famous faith fraudster on BET selling magic water and supernatural cures. It wasn't a show, but an infomercial, but the contours of the program were identical to the performances that made Popoff infamous in the 70s. In clipped sentences, punctuated by inappropriate uses of the word "Amen", Popoff hawked his magic water and told viewers of his supernatural faith-healing abilities. Through the magic use of Jesus's name [amen] tumors had been made to disappear [amen] sight had been reeeee-stored to the blind, and the lame had cah-limbbed out of their wheelchairs [amen!] Dramatic footage from Poppoff's revival meetings reinforced the claims. We saw Popoff throw canes and crutches on the alter, as their owners danced. As the cameras rolled, and the organ played, one person after another approached the microphone to praise Popoff and to testify about the miracles he had brought about. Its all flim-flam, of course. Popoff is a notorious bunko artist who was exposed as a cheat in the early 80s by James "The Amazing" Randi." Why BET is permitting him to run his informercials and prey on a new generation of suckers is anyone's guess. What I find deeply troubling, however, is how similar the Popoff routine is to the workings of various Orthodox Jewish charities. We've all seen the notorious Kupat Hair letters promising blessings in exchange for money, and as cruelly deceptive as they are, that's really just the tip of the iceberg. In advance of every Jewish holiday, I receive RoboCalls in which a thickly accented man promises me riches, cures, shidduchim, and blessings if I send him a check. His clipped sentences are punctuated by inappropriate uses of the words "Baruch Hashem" and the Gedolim, rather than Jesus, are the conduits for the miracle; otherwise the RoboCaller's routine is a dead-ringer for Popoff's. These are all scams that prey on the desperate and separate the stupid from their money. Its an outrage and a failure of Orthodox Jewish leadership that they are allowed to continue. Those rabbis, and community organizations like Aguddah, or journalists like Pinny Horowitz Lipshutz of the Yated, who sit silently while Kupait Hair and noted Hasidic Rebbes take advantage of the gullible masses are nothing but cowards and collaborators. All of their inveighing against blogs, and short skirts are smoke and vapor until they show themselves capable of standing up to the thieves with fancy names, and prominent letterheads. All of their whining about the respect due to Jewish leaders are as nothing until the Jewish leaders who use religion to steal from us are exposed as frauds and cast out. Search for more information about Peter Popoff at 4torah.com. These are old, but new to me, and perhaps to you as well. Search for more information about FAUX Snooze, and Newsmuck at 4torah.com. Post any thoughts you've had about the parsha to this post's thread. It doesn't have to be your original thought, but be sure to credit it. Keep it short. The ParshaNotes style is terse and brief. No more than two or three sentances, please. Links to longer discussions on your own blog, or elsewhere, are ok. In fact, I encourage it. If you don't have a blog, do your favorite blogger a favor and provide a one sentance summary of his or her awesome Mishpatim post, with a link. Today or perhaps tomorrow, I'll post my edition of ParshaNotes with your submissions included. Search for more information about the sedra of the (last) week at 4torah.com. A video depicting the Orthodox Jewish Teddy Bears discussing homosexuality was blogged recently by Andrew Sullivan at the Atlantic who adds: "To say I empathize would be an understatement. My own lengthy discussion of reparative therapy and the legacy of Freud with respect to homosexual orientation (I remain a fan of Freud's) is the second chapter of Love Undetectable." This guy (the chief rabbi of Kiryat Arba) is an ignorant bigot. I’m resisting the temptation to use stronger terms. "Sefer HaChinuch states that the character traits of the father pass on to the son. If the father in not Jewish, what character traits could he have? Traits of cruelty, of barbarism! These are not traits that characterize the people of Israel." Right. All non-Jews are cruel barbarians. And all Jews are “merciful, shy and charitable”. "I even read in books that sometimes the crime, the difficult traits, the bitterness – a child that comes from these traits, it's no surprise that he won't have the qualities that characterize the people of Israel." What else? Let’s see. Children of single mothers by choice become criminals. And it’s the fault of western influence that women are getting married late. They should be concentrating on their real role, that of child rearing. Looks like Religious Zionism is in good (sexist and racist) hands. Search for more information about Rabbi Dov Lior at 4torah.com. Religion: What is it good for? The Kotzker Rebbe's yahrtzeit was yesterday The Heilige Kotzker, as he's known, was a man who devoted his entire life to the pursuit of truth, and to a relationship with God. Yet he, like many other Tzaddikim was extremely depressed. 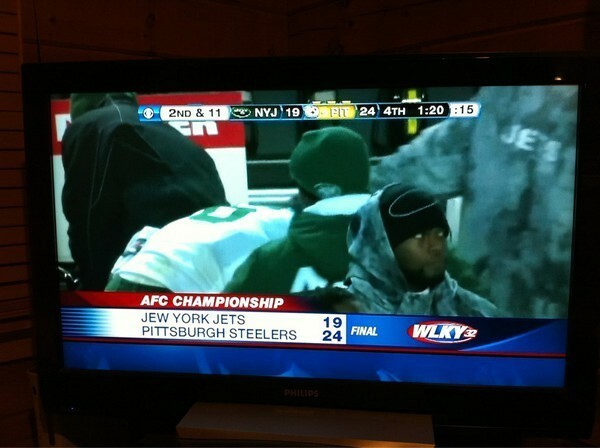 How does this reflect on Judaism? 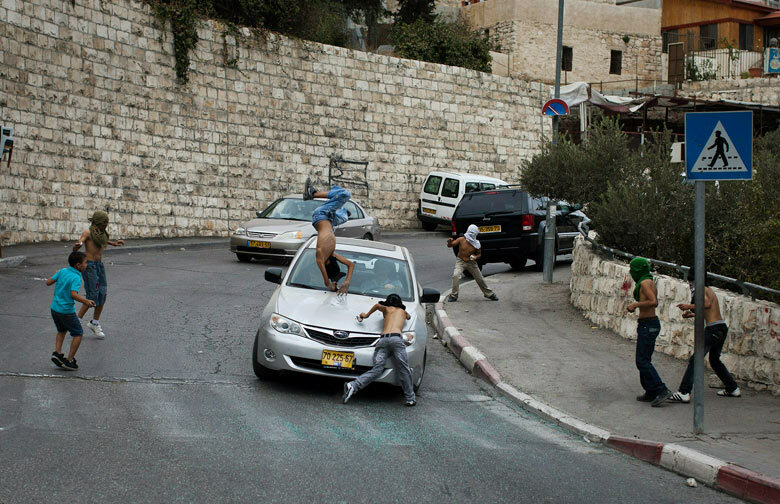 An Israeli motorist runs down a masked Palestinian youth who was among a group of boys throwing stones at Israeli cars in the mostly Arab east Jerusalem neighborhood of Silwan. The boy was injured but his condition was described as stable. Search for more information about Jew York at 4torah.com. Last week a 60 year old woman was arrested for trying to smuggle 44 iPhone 4s into Israel. I'm not an alarmist when it comes to anti-Semitism. Nor do I look to be offended by any slight bias or ignorance from the media when it comes to frum Jews. See, the photo is a stock photo, it has nothing to do with the article. But it implies that the woman who was arrested was a charedi woman, dressed in Charedi garb. However, the article is about a woman dressed in traditional Georgian garb smuggling 44 iPhone 4s into Israel. While I can see how traditional Georgian garb could be confused with traditional Polish garb such as the Charedi garb of 2011, the photo does more than illustrate traditional garb at Ben-Gurion, it subliminally suggests that the woman was Charedi. For all we know, she could have been Charedi. But no news reports even hint that she was. Search for more information about anti-frum media bias at 4torah.com. In Exodus 23:28 the Lord promises to assist with the driving out of three Cannanite nations through the use of a tsir-aw צִּרְעָ֖ה, the definition of which is the stuff of a fascinating discussion. (summarized by Prof. Haim Genizi). J. Garstang: The word bee is a metonym for Egypt, because it was used as a symbol for the country itself. The bee hieroglyph was first used to denote the king of Lower Egypt (the king of Upper Egypt was denoted with a reed), and is found on inscriptions from the First Dynasty down to the Roman period. Gerstrang reasons that the verse is promising that Egypt will help pave the way for conquest, and indeed letters and the like have been found suggesting that Egypt had dominion over the Canaanite people in ways that likely weakened their kings. For skeptics, this is a subtle example of vaticinium ex eventu. Robert Alter: Observing the previous verse [Ex. 23:27] in which God promises to send his "terror" [ אֵֽימָתִי֙] Alter proposes that tsir'aw be emended ra'ats, which means Smash. (its a rearrangement of two letters) As he says, this change produces a parallel (much of the section seems to be written in verse) with "terror" suggesting that God will send his terror, and smash the opposition. Search for more information about vaticinium ex eventu. at 4torah.com. 23-year-old Jason Bailey -- a 3rd round NHL pick in 2005 -- claims from the moment the Ducks assigned him to play for an affiliate team called the Bakersfield Condors ... his coaches unleashed a "barrage of anti-Semitic, offensive and degrading verbal attacks." In the suit, filed today in Orange County Superior Court, Bailey claims the head coach of the Condors told him "[Jews] only care about money and who's who" and that he "never wanted his son to be raised Jewish or to wear a Yarmulke." Bailey claims the assistant head coach would get in on the Jew-bashing too -- saying things like, "Oh, I just got a friend request from a dirty Jew." Bailey says the coaches also forced him to travel apart from the team and he was "rarely given any ice time" in games because he's Jewish. According to the documents, filed by Bailey's powerhouse lawyer Keith Fink, Bailey complained to the Ducks about the hostile work environment -- and the team reacted by instructing the coaches to pen apology letters to Bailey in which they both admitted to using hurtful language. Bailey was eventually traded to the Ottawa Senators in 2009 -- and insists the Ducks were "happy to be rid of him." Bailey is suing for unspecified damages. Calls to the Ducks have not been returned. We recognize the tie (its very OJ) but not the face. As of this morning, we still have not identified the fellow. One of the Elders, I guess. 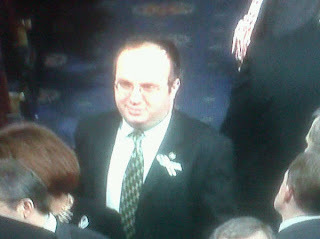 Search for more information about #sotu at 4torah.com. Did Hosni Mubarak Flee the Country? Amid unconfirmed rumors that Hosni Mubarak and his family have quit Egypt, we give you this remarkable video of protesters defacing his image. As Jeffery Goldberg said, "This is not something that usually happens in Egypt." Avi Shafran vs Al Jezeera: Who has more respect for free expression? On a number of occasions my attention has been drawn to the fact that some of my essays posted on Cross-Currents have elicited in their comments sections negative remarks about, portrayals of, or insinuations concerning various groups of Jew... And so I have decided to disallow comments altogether to my postings. Avi and Al Jazeera are both concerned about uncivil comments; the difference is one recognizes the value of vigorous conversation, and the other does not. This is why Al Jezeera prefers to moderate comment threads and preserve opportunities for debate, whereas Avi prefers to ban them. Search for more information about things that strange but true at 4torah.com. Search for more information about the Two Ronnies at 4torah.com. While the release by Al Jazeera on Sunday of over 1600 documents relating to a decades’ worth of U.S.-managed Palestinian-Israeli negotiations is certain to impact both the negotiations themselves and perceptions of those negotiations, because there’s so many of them, and because their veracity remains in question, it’s probably best for the moment to hold off on grand pronouncements about What They Mean. But here are a few impressions. The Times has an article today about one of the saddest ceremonies in our tradition: The circumcision of a deceased infant. Reading it, I could only think of that strange ungrammatical sentence my grand-mother would utter whenever she heard some terrible news: We should never know from this. 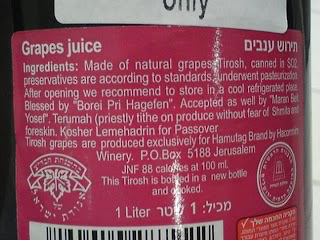 Search for more information about ingredient labels at 4torah.com. 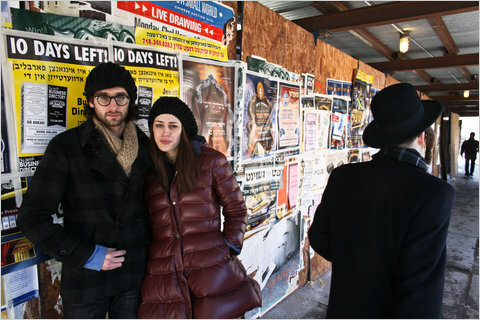 Lazer Weiss and Melissa Weisz, the leads of “Romeo and Juliet in Yiddish,” along Lee Street in South Williamsburg. In Shakespeare’s tragedy, Romeo is so steeped in love poetry that Juliet accuses him of kissing “by the book.” By contrast, Lazer Weiss, who plays the lead role in the new film “Romeo and Juliet in Yiddish,” [ see the trailer] didn’t understand the concept of romantic love until he was in his 20s. Did the Covenant Code come out of a vacuum? Any first year bible student knows that there are significant similarities between the Laws of Hammurabi and the Covenant Code [i.e. most of parshat Mishpatim]. These similarities include the topics discussed, the penalties imposed, and the way the laws are phrased. Significant differences between the two sets of laws have also been identified. These differences also relate to the topics discussed, the penalties imposed, and the way the laws are phrased. In some instances even the wording of Hamurabbi's Code bears what Kugel calls a "striking resemblance" to the Bible. What explains this? Suppose a new 21st century religious sect were to announce a divine revelation that corresponded in key ways with the Magna Carta. Though this would not be an argument against the revelation itself, it would be good grounds for saying that the new religious sect hadn't started with a completely clean slate. (1) God might have given Moses a CC that shared aspects with the LH.There are any number of reasons why God might have done this. (2) Even if CC was written by a human, its still OUR CC and it still has religious and historical significance, that can't casually be dismissed. If a man pushes a pregnant woman and she miscarries, but is not otherwise hurt, then the offender pays only a fine to the victim's husband. This has interesting implications for how we think about abortion—in particular about the claim that killing a 17-week-old fetus is the same as killing a 17-year-old. According to Exodus, it's not. As [a reader] writes: "The text seems to clearly state that the destruction of a fetus is not a capital offense. It is a property crime for which monetary compensation is paid." Search for more information about abortion at 4torah.com. What does it mean for a house of parliament to be too democratic? Is this a coded way of saying they wish a rabbi or committee of rabbis held sway? "Do you mind if I keep my hat on," I said to the neighbor as I entered her house. I was there to meet with her husband about a business matter, and was wearing a cap to protect against cold and wind. It had been on my head for hours, and I was now reluctant to remove it and expose a head of flat, sticky hair. "Not at all," she replied, "Though if we were sitting down to a meal together, I'd take offense." A short conversation ensured about family mores. In her house, the children all must ask to be excused before they're permitted to leave the table. In my house, no one eats until the cook sits down. "Each family is different," she said by way of summing up, and of course she's right. Or, to go a step further, each family is different and that okay. We're not better people because we wait to eat until my wife is seated; the neighbors aren't our superiors simply because their children have been taught to utter a specific formula in a specific situation. A family isn't deemed a success by virtue of its embracing certain manners, or because it playacts certain rituals; rather, success is a measure of how happy and healthy the members of the family are. Certain rituals and manners might lead to health and happiness; likewise, the act of performing certain rituals might create happiness for those who perform it, but, for the most part, guaranteed outcomes are rare. Many of the tensions in a new marriage are produced as husband and wife adjust to each other's idea of normal. 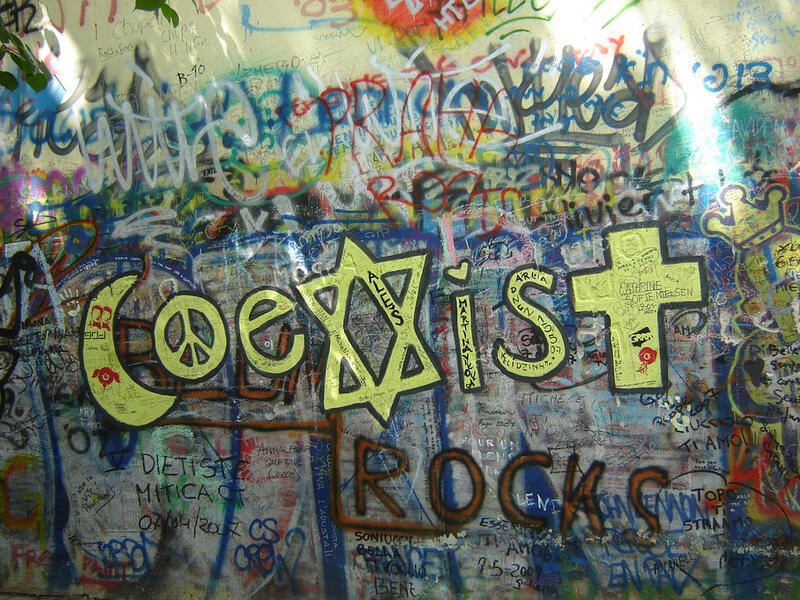 The disagreements between Jewish neighborhoods and Jewish sects often result from something similar. If you've been raised to perceive a particular pronunciation of Hebrew, or a particular nusach or seating arrangement as "normal", someone elses perfectly good shul can seem foreign, and inauthentic. If the goal is serving the creator, or doing good int he world, or increasing health and happiness should artifacts, manners and styles matter? Yet they are often a subject of Jewish complaint. Perhaps, this is because the very act of complaining, and demeaning the styles and manner of others is itself often a source of happiness for the one who is doing the complaining. Search for more information about banal observations such as this one at 4torah.com. Nice, right? Way to perpetuate the prejudices, Governor Bently. Later he apologized, but I sort of think he meant what he said, when he sent it. I also think he was speaking about Muslims and atheists just as surely as he was speaking about Jews. Doesn't matter, though: I don't live in Alabama where his gentle bigotry might affect me, and honestly I'm pleased the dope doesn't consider me part of his family. Search for more information about Jew-hating Christains such as this one at 4torah.com. Welcome to another edition of ParshaNotes, this one sponsored in honor of all DovBear guest posters, past and present, by a generous, anonymous donor. Christians often forget that Jesus was not one of them, but one of us. They speak of Jesus teaching or arguing with "the Jews" forever oblivious to the fact that both Jesus and "the Jews" would have thought of each other as members of same religious and ethnic group. Jews are guilty of the opposite mistake, specifically toward Moshe's wife Tzipporah. Perhaps she converted (in whatever way that was done before the Torah was given) but she hadn't shared in the history or the burdens of her husband's nation. Their suffering was not her suffering. Her arrival with Jethro, after the Exodus has been executed, drives home the point that she was not one of us. 18:4 Moshe calls his second son Elazar, because [Moses said,] "The God of my father came to my aid and rescued me from Pharaoh's sword." When? As the Midrash notes this must refer to an episode not depicted in the narrative. The story of Moshe's Magic Marble Neck is the (likely invented) solution. God's original deal with Abraham was that we would practice justice and righteousness. Now [19:6] He says "And you shall be to Me a kingdom of princes." Moshe demonstrates modesty when he speaks to his father-in-law. Though Yisro arrived after hearing of all "God had done for Moses and for Israel his people..."; Moshe, seven verses later "told his father in law all that the LORD had done unto Pharaoh and to the Egyptians for Israel's sake..."
The ban on taking God's name "in vain" may have originally had the sence of "making use of the name in a (false) spell or incantation", as opposed to using it in casual speech. (Alter) Nowadays, of course we're meticulous about not ever mentioning the name, but flock to clairvoyants who offer to work miracles, often through various uses of the name. Rashi on 19:17: at the bottom of the mountain According to its simple meaning, [DB: Which no Rabbi or preacher ever mentions.] at the foot of the mountain. Its midrashic interpretation is, however, that the mountain was uprooted from its place and turned over them like a vat. — [from Shab. 88a] I don't believe even the midrashic interp. here is meant to be taken literally. Rather, I believe the author of the midrash is saying that following the miracles the Israelites had seen, they were in no position to refuse God's invitation; thus it was as if the mountain was being held over the heads. A better answer: The verses put God in two places at once: On the one hand, it says "And the Lord went down upon the mountain" and elsewhere reports that God "called to [Moses] from the mountain." Later, God says "You have seen for yourselves that I talked to you from heaven," and at the end of the story Moshe recalls, "Out of heaven He caused you to hear his voice." So which is it? Heaven or mountain? If the Mountain was lifted, the problem is solved as this allows God to be both on the mountain and in heaven simultaneously. See this and this. - Twice we're told the people heard (or will hear) the sound of a ram's horn, but no information is provided about who is blowing it. At the first mention, the horn is called a "yovel" prompting Rashi to say, "the ram’s horn Heb. הַיוֹבֵל. That is a shofar of a ram, for in Arabia, they call a ram “yuvla.” Do I misunderstand here, or is Rashi glossing a word based on how its used by non-Jews? If so, why? - How many names did our title character have? According to Shimon bar Yochai, he had two names, "Hobab" and "Jethro" (Sifre, Num. 78). Elsewhere, we're told he has 7 names "Reuel," "Jether," "Jethro," "Hobab," "Heber," "Keni" and "Putiel". Per the critics, the different names represent different people and/or different textual traditions. - What was his occupation? One tanna says he was a priest of idolatry; another says he was a prince in Midian. Rashi 19:4 on eagles’ wings Like an eagle, which carries its young on its wings, for all other birds place their young between their feet since they fear another bird flying above them. The eagle, however, fears only man, lest he shoot an arrow at it, because no other bird flies above it. Therefore, it places them [its young] on its wings. This is an excellent image, but the facts are false: Eagles don't actually carry their young on their wings. Ever notice how Moses' earliest displays of leadership qualities are the exact antithesis of Pharaoh's? Pharaoh frequently consults with advisors and magicians and various court functionaries Moshe, famously, tries to do everything himself until his father-in-law suggests a better way. Pharaoh, in the Joseph story, is deeply concerned about feeding his people; in the Mechiltah's interpretation of the fleshpot verses he is said to have kept the slaves extremely well fed; under Moshe's leadership, on the other hand, the people frequently complain of hunger, and Moshe always meets their complaints with anxiety or rebuke, never with action. Pharaoh is described and represented as supremely arrogant; Moshe is called modest, and indeed behaves modestly when he describes his role in the Exodus to Yithro. Search for more information about biblical antitheses at 4torah.com. Thanks to Google, I see that today is the 50th anniversary of JFK's inauguration, a day best remembered by Orthodox Jews for something that didn't happen. According to frum legend, Kennedy was the first president to appear at an inauguration with no hat; magically the hat industry immediately went into a decline from which it still has not recovered. "Were it not for Kennedy," goes a mashgiach's rant I've twice heard with my own ears, "and his corrupt ideas about freedom, men would still dress modestly." The flaw with this theory isn't merely the lousy logic; the facts are bad, too. So in honor of the big anniversary, let's set the record straight: Kennedy wore a hat to his inauguration. Search for more information about stunts at 4torah.com. Worst Yom Kippur Video - EVER! The sad and frustrating thing is that stupid Sarah, stupid Sean, and their stupid supporters aren't going to learn a damn thing from this. You may be hitched to one of these creatures we call ‘Western man and I think part of your job is to keep him Western, to keep him truly purposeful, to keep him whole.” Stevenson had, he affably confessed, “very little experience as a wife or mother”; but he believed that the housewife’s task was a worthy one, since “we will defeat totalitarian, authoritarian ideas only by better ideas. The wife is there to implant those ideas in her working husband. It seems almost a kind of magical thinking that caused people to believe that keeping capable, highly educated people at home—actually de-incentivizing them from entering the workforce—was a good way to win the Cold War. Sounds familiar doesn't it? Swap the words "win the Cold War" for "defeat the yetzer hara" and the match is made. Search for more information about Eshel at 4torah.com. Rabbi: Marry-off Girls at Age 15. "The haredi press is also guilty," the source added, "Because it promotes an agenda that says women must be educated. This is very unfortunate and is promoted not by rabbis, but by businessmen that control the education apparatus. Search for more information about hatred of women at 4torah.com. If you were a Martian arriving on earth, and had nothing to go on aside from the flyers contained in this post (after the jump), which community and institution would you decide was more serious about Torah? 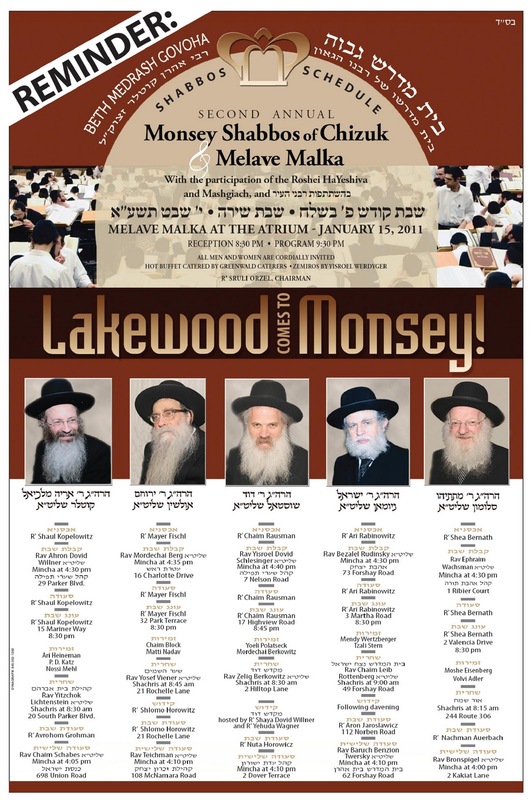 Of course, no reasonable person would make such a decision on the basis of flyers alone; still, the fact that the flyer advertising a YU Shabbas lists speakers and lecture topics, while Lakewood's flyer merely lists opportunities to eat and sing must mean something. See the flyers after the jump. As I say in comment #27, I think the true explanation for how the events were structured and promoted is as follows: Lakewood is trying to make friends, and you make friends via social events where you can hang out, not via lectures, whereas YU is trying to seem scholarly both because its a university, and because it may not have the strongest Torah reputation in some quarters. ...which of course reminded me of the famous Disney sequence on Family Guy's universe hopping episode. Why is it conventional wisdom that the mouse house hates us? Search for more information about Disney and the Jews at 4torah.com. In 1965, after walking in the Selma-to-Montgomery civil-rights march with the Rev. Dr. Martin Luther King Jr. 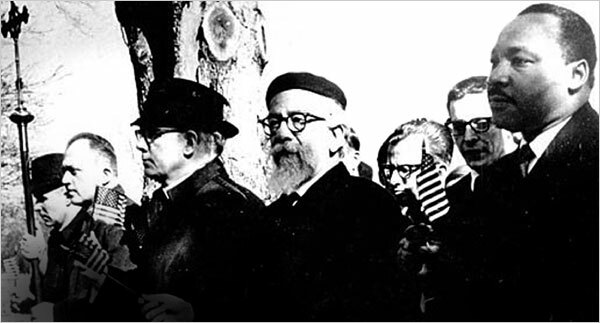 Rabbi Abraham Joshua Heschel was at the Montgomery, Ala., airport, trying to find something to eat. A surly woman behind the snack-bar counter glared at Heschel — his yarmulke and white beard making him look like an ancient Hebrew prophet — and mockingly proclaimed: “Well, I’ll be damned. My mother always told me there was a Santa Claus, and I didn’t believe her, until now.” She told Heschel that there was no food to be had. Did your kids bring home bird feeders last Friday? Mine, too. Did you put them out? Me niether. Some amature internet research reveals that there was once an actual custom in some European communities to put out food for the birds on Shabos Parshas Bshalach. In our day, the custom seems to be something else involving school crafts and good intentions. The official reason for the custom is a Mechilta which describes an evil plot to embaress Moshe that was foiled by the birds. To say thank you, our ancestors put out crumbs. Though I rather doubt this is the true source of the custom I must admit that I have not been able to find a shred of evidence in support of my skeptism. I think the reason Mike & others are pushing back on this one is that they don't see the irony in stating truth that the frum community is just like every community - a few people may be sincere and learned, but the vast majority are into food, sleep, and presumably other physical needs. [DB: And also they many aren't much interested in hearing a scholar deliver a serious Torah lecture and will only turn out in large numbers to greet someone they allegedy consider a demigod if plenty of good food will be served] That is not in itself surprising or bad - but it doesn't pass muster for a community that elevates itself as holy & special. In short, the emperor has no clothes. Again, I say the Lakewood dog and pony show has no parralel in the secular world. Secular celebrities draw crowds without offering bribes in the form of food and personal access. In fact they charge admission. When great scholars visit academic communties serious lectures are desired and expected. In Monsey there were no serious lectures and the flyer suggests strongly that crowds could not be counted upon to materialize at free events starring the rock stars of the Yeshiva world without the promise of free food. Doesn't this lead you to certain obvious conclusions? Flyer advertising "Shabbos of Chizuk" reveals unflattering truths about the Torah True community. Summary: Read with an unjaundiced eye, I think a flyer advertising a recent Shabbos of Chizuk reveals some unflattering truths about the Torah True community. Every so often the Lakewood Roshei Yeshivot attempt to colonize new areas by participating in what's called a "Shabbos of Chizuk" with each Rosh Yeshiva functioning as something like a scholar-in-residence at one, or more, of the neighbored shuls. Drashot are given, friends are won, and after shabbos, checks are written. Aside from the fact that Lakewood has yet to reciprocate by inviting the Y.U Roshei Yeshivot to their town for a "RIETS Shabbos" its all good fun. 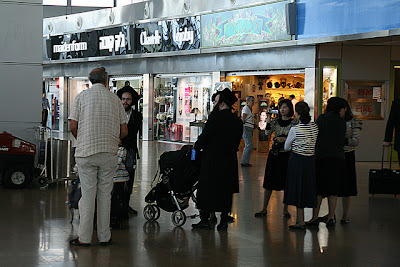 The Roshei Yeshivot get to enjoy the many pleasures of a business trip; their groupies get to collect autographs or blessings or whatever; those with an abiding wish to be separated from their money are provided with a comfortable bkovidik forum where this can occur as painlessly as possible. Recently, the RYs were in Monsey for an event advertised with the flyer you see below. Interpolation: Calling this dog and pony show a Shabbos of Chizuk is a masterstroke. In context, the word chizuk means "strengthening"; out of context it might mean "hardening." Hardening men up before asking them for money is an age old game, no? And, in that vein, calling this a masterstroke was also a masterstroke! Ad kan vulgar puns. End Interpolation. Search for more information about the Rebbe at 4torah.com. The evil bloggers have been attacked again in this week's Yated. Of course the bloggers are bad because they cause people to question the flaws in their community. Of course the bloggers are bad because they get in the way of the privieleged few who are permtted to have a voice. Of course the bloggers are bad because they portray all frum people as backward and evil. Although the article is moronic for a million and one reasons, its author makes an important point that will unfortunately not get any attention becuase its container is so silly. Our response to those who seek to destroy our way of life must be to reaffirm our sacred values, to learn more Torah, and to learn with more hasmadah and fervency. Our response must be to be kind and considerate to our neighbors, Jew and gentile, and to make a kiddush Hashem by who we are and how we live. We have to do more to prove that we are upright, upstanding and outstanding. That means rejecting double standards and shortcuts in integrity. We must take pains to be consistent, scrupulously honest, and fair in all our dealings. We must never skirt the law or act in a way which can be misinterpreted to our discredit. While I may not agree with everything quoted, the idea is a noble one. If frum Jews don't want to be smacked around by bloggers, stop giving them a reason to smack frum Jews around. The author is saying that frum Jews need to clean up their act. And he is right. Not a great article overall but this is good advice and needed rebuke. Search for more information about good points in bad articles at 4torah.com. When he realizes the Israelites are gone and not coming back, Pharaoh bursts into song. Sort of. As recorded in the Bible, when Pharaoh tells his courtiers that the escaped slaves are pinned down, he is speaking in verse. In English, Pharaoh words mean something like: "They are wandering aimlessly in the land; the wilderness has shut them in. "(NASB) or "They are confounded in the land, the wilderness has closed round them" (Alter). In Hebrew the line is: נְבֻכִ֥ים הֵ֖ם בָּאָ֑רֶץ סָגַ֥ר עֲלֵיהֶ֖ם הַמִּדְבָּֽר or nevukhim hem ba'arets, sagar 'aleihemn hamidbar. As Alter points out these are "two semantically complementary clauses with three nicely scanning beats in each". Alter goes on to say, that this is evidence of the kings "regal confidence" but I think there may be something else to it. Above, I wrote that Pharaoh spoke "to his courtiers" about the Israelites and this is based on Rashi and most of the English translations, of the full verse which reads: וְאָמַ֤ר פַּרְעֹה֙ לִבְנֵ֣י יִשְׂרָאֵ֔ל נְבֻכִ֥ים הֵ֖ם בָּאָ֑רֶץ סָגַ֥ר עֲלֵיהֶ֖ם הַמִּדְבָּֽר׃. At first glance, however, the verse itself seems to say something else, telling us that Pharaoh spoke לִבְנֵ֣י יִשְׂרָאֵ֔ל, which translates most obviously as "to the Israelites." As Rashi and the rest realize Pharaoh can't be speaking "to the Israelites" who are by now almost a week into their escape. Rashi's solution is that the lamid prefix [=לִ] also means "about", and though this is grammatically sound, I think it robs the verse, and indeed the whole story, of some literary grandeur. Pharaoh's one line poem marks the beginning of the Exodus' final chapter, a chapter that ends with the Song of the Sea. As Pharaoh will soon discover, the Israelites are not wandering aimlessly, but are bait in a trap. Alter is right that given all he has experienced at the hands of God Pharaoh is foolishly overconfident. Though this fatal overconfidence is certainly indicated through his style of speech, a literary observation is that Pharaoh's song stands in opposition to the song the Israelites will sing after the king is vanquished. As the text tells us though its ambiguous use of the lamid prefix, Pharoh is singing TO the Israelites... only his song is cut short - its merely one verse - and it will soon be emphatically answered at the Sea, when the victorious Israelites answer Pharaoh's arrogance with a much longer song of their own, a song that even opens with a brilliant pun on the Hebrew word for arrogant. ** Interesting side note: Rashi solves the lamid prefix problem by translating the verse as "about the Israelites" TPJ reads it as most of us would, i.e., as "to the Israelites" and even supplies their names! According to TPJ, at this moment Pharaoh is speaking to none other but Datan and Aviram. Search for more information about powerful parshanut at 4torah.com. Yesterday, I tried to link to Kylopod's post about the origin and uses of the words "blood libel" but blogger broke the URL. And as someone said on Twitter, claiming some press comments are a blood libel is like saying a bad day at work was a Holocaust. Also see Klypod's: Is blood libel a generic expression? Search for more information about Colbert at 4torah.com. Who's the Jewish kid @21:04 of $pringfield (or How I Learned to Stop Worrying and Love Legalized Gambling)? Search for more information about Jews at 4torah.com. What is the "Way of Philistines"
Sarna reasons that such an important trade route was likely fortified by the Egyptians, and suggests that God's concern in Exodus 13:17 is not marauding Philistines but Egyptian soldiers who might have seen the mob of unprotected Israelites as an opportunity for sport and profit. Search for more information about mistakes our Rabbis made at 4torah.com. Palin effectively quoted Ronald Reagan arguing that the criminal alone is responsible for the crime. "Acts of monstrous criminality stand on their own. They begin and end with the criminals who commit them," she said. Good. Then she went on to say that "journalists and pundits should not manufacture a blood libel that serves only to incite the very hatred and violence they purport to condemn." Bad. You can't argue that words don't create criminals and then argue in the next breath that, actually, yes, they might. A very good catch, that does much to show just how cynical this woman is. Words are just words when she uses them, apparently, but dangerous weapons in the hands of her opponents. The fact that she was able to flip-flop so completely in the space of one paragraph when reading from a prepared script, says a lot about how the woman's neurons misfire. Likewise a comment this morning from my old friend Akiva shows how her supporter's neurons also misfire. He writes: The fact that a private person with no political office gets this amount of attention for her statements is astounding. And her down home forthright method of approaching issues speaks much better to the average American than the normal political drivel. The good news for DovBear, Sarah Palin is going to be around for a while and very likely make it to the presidency. She'll be giving this blog much to write about in the years to come. Yes, yes. The though of America being led by someone who quit because she found governing Alaska too stressful is definitely Good News. If she can't handle a state that's smaller than 20 American cities I'm sure she'll do great in the Oval Office. ...when it was obviously much more like an atom bomb dropped on Nagasaki. Slate's William Saliten said this earlier today and I am happy to repeat it: Sarah Palin is a hypocrite. In her now famous blood libel video she made some hippie remark about how entire communities must never be blamed for the violent acts of the few. Uh huh. Well what about when the violent few are Muslims, Sarah? Hmm? What then? As Saliten reminds us it was stupid Sarah who first made the ground zero mosque into a political issue, and she also refused to let up even after the mosque's imam denounced terror on national T.V. Sarah didn't care about the facts. No matter how much effort reasonable people put into explaining elementary points to her, she continued to use her Twitter and Facebook accounts to call on real Americans to do the honorable thing i.e hold all Muslims responsible for the acts of a violent few. I'm not so crass or insensitive as to refer to what Sarah did as a "blood libel" but an ordinary libel it most certainly was. Nowadays, you're considered a heel and a boor if you don't welcome your daughter's fiancee into the family with a complete set of the Talmud Bavli, Vilna edition. This can run several hundred dollars and as a gift its absurdly impractical. Your average twenty-something punk is usually not into learning and when he's ready to settle into a nice middle age Daf Yomi shiur to make friends and impress neighbors he'll probably use the Artscroll anyway. The rare son-in-law who actually does want to spend his time leaning over a Gemarah likely already has the books he needs or easy access to them and likely won't ever use most of the volumes in the complete set. I mean who learns Zevachim outside of a Daf Yomi aside from the rare scholar who, sorry, is probably not marrying your daughter. Besides, volumes from the fancy sets are much too heavy to shlep around and look best sitting on the shelf -which is of course the whole point of the exercise. We Jews like to pretend we're scholars and we like to pretend our daughters are marrying scholars. It's why every ignoramus is supposed to give a learned sounding speech at his sheva brochos and why those same ignoramuses receive expensive books that ultimately end up as living room or study decorations that attempt to proclaim to all that their owner is a scholar, but in reality announce only that he has a father-in-law who follows convention. When it's my turn, the son-in-law can have an IPad shas. It's lightweight, searchable, and costs about thirty bucks. Best of all it immediately let's the young man know that he shouldn't look to me for financial support. That, my friends, is called setting the tone from the outset. Try doing that with a leather bound shas. Typically, the segula debate is a polarizing venture, pitting (for lack of better terminology) rationalists against mysticists. The mysticists fully believe in the power of segulos. They think some may be more powerful than others, but in the end, they all work. On the other side of the ledger are the rationalists who are more skeptical of the power of segulos. 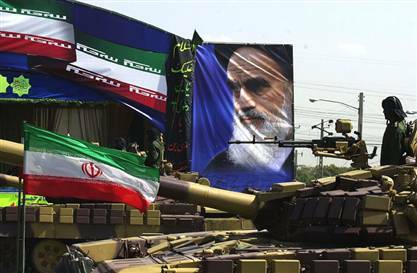 I assume they don't believe in their efficacy and therefore do not participate in mass segula events like Parshas Ha'mon. I think both of these approaches are wrong. I suppose it is true that some on the left used the Tucson massacre to bash Sarah Palin. Largely this bashing of Sara was committed by people who dislike her and regularly mock her. Whatever was said about her post-massacre was not opportunistic but business as usual. We saw the exact same thing after a gunmen shot up Fort Hood. If its true that the left used Tucson to point out that Sara and her coevals have injected unprecedented toxicity into the political discourse, it doubly true that the right used Fort Hood to push for the acceptance of pet policies in the name of national security. For the right, every Fort Hood style attack is Christmas because until the dust clears the right gets to bash Arabs, push for further limits on personal freedom, denounce democrats as soft terror, and strut around like some martial peacock of old using get-tough rhetoric. Search for more information about rw double standards at 4torah.com. When God leads the Jewish people out of Egypt, in the beginning of this week’s parsha, He takes them the ‘long way,’ purposely bypassing the shorter route since it would lead through the land of the Philistines. Rmbam and Ramban argue about the significance of this in ways that relate to the underlying philosophy of commandment-keeping. As you may have noticed, the Song of the Sea says nothing about the sea being split. What this might mean is discussed here. The Song of the Sea is introduced with the phrase אָ֣ז יָשִֽׁיר־; forty years later when the sun stands still Joshua celebrates the miracle with a song that begins with the phrase אָ֣ז יְדַבֵּ֤ר. Women are depicted as celebrating a military victory at the Sea and also in the Book of Samuel. Throughout the Exodus story, the word Kaved is used to describe the labor, and the king's heart. Later it is also used to describe Moshe's hands. Who was first into the water? Sota 36b gives two opinions, quoting one Tanna who says Nachshon ben Aminadav of the tribe of Judah was first into the water, and another who says the glory should go to the entire tribe of Benjamin. What is the significance of the famous fleshpots (flesh being an old English word for meat)? Mechilta says the Israelites ate well when they were slaves; Shmos Raba says they merely sat by the fleshpots, smelling the food, but were not allowed to take from it. When the Jews complain to Moshe in Exodus 14:11-12 Egypt is mentioned 5 times, and the wilderness is mentioned twice. Narrative units in the Bible are frequently bookended with long poems. The Song of the Sea marks the conclusion of the Exodus story, and the beginning of the Wilderness tales. Which parts of the Song are really parts of the poem, and which are not? horse and rider may be an anachronism: At the time Egypt used chariots, not cavalry. Who is like you among the gods possibly indicates that the Israelites weren't quite yet monotheists when then song was first composed. You will bring them and plant them in the mountain of Your inheritance, The place, O LORD, which You have made for Your dwelling, The sanctuary, O Lord, which Your hands have established seems like a clear reference to the Temple, and can be understood as either prophesy or evidence of later tampering. Sarna, incidentally, uses this to explain away the problem of the too-large multitude that was said to have participated in the Exodus. As is well known, (see this and this) (and don't miss serious counterarguments in the comments) nothing that we know about the ancient world, and nothing that archaeologists have found in the Sinai lends even an iota of support to the idea that 600,000 (or 3 million) people left Egypt. Sarna's solution is ingenious. He says that Temple in Jerusalem was the point, or goal of the Exodus. At the time the Temple was built, the population in Israel was about 600,000. Saying that 600,000 left Egypt is a literary way of connecting the Exodus with the Temple, similar to how even the children of immigrants speak of their "American forefathers. Kee goah goah is a great pun. It means "to be exalted" and is also the word for a sea surge. Azi v'zimras is another pun. Zimrah means both song and power. We're told all of of Israel sang at the Sea. How did everyone know the words? In Exodus 14:13 Moshe promises the Israelites that Egypt will never afflict them again, yet Egypt is depicted throughout the Book of Kings as a threat. 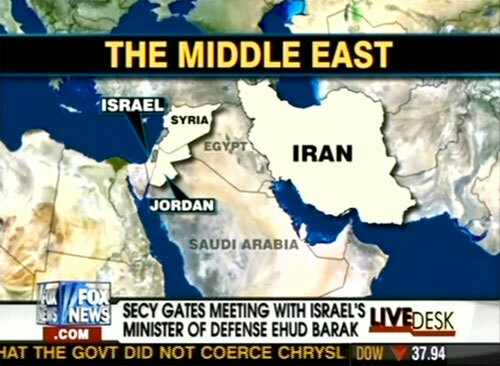 Exodus 13:17: "...for it was near and it was easy to return by that road to Egypt. There are also many aggadic midrashim [regarding this]. "What are those midrashim? (b) For it was too near (in time) to when the Canaanites had taken the land, and they weren't yet deserving of genocide/expulsion etc. Why doesn't Rashi use these midrashim to interpret the verse? Because they don't solve text problems. Why does Rashi say this? Look at the verse: And Moses stretched out his hand over the sea, and the Lord led the sea with the strong east wind all night, and He made the sea into dry land and the waters split. The verse uses the word "sea" three times, but when the miracle happens the language switches and we're told "the waters split." A polite reminder for the Orthodox clergy: In your speeches this shabbos, please do not tell us that Moshe or the Jewish people "sang Az Yoshir." We know what you mean, but its imprecise. The first words of the song are not "az yashir" but "Ashira l'hashem kee goah goah" and the proper name of the song is "Shirat Hayam"
Search for more information about Beshalach at 4torah.com. Debbie Friedman: The Reform Shlmo Carlbach? How long did Moshe's mother carry him? A reader asks: Are Jews white?